The land of Great Discoverers that has given the world explorers like Vasco da Gama and Ferdinand Magellan indeed inspires to set off on an adventure of your own. But when is the best time to visit Portugal to avoid bustling tourist crowds and unpleasant weather conditions? In this article, we’ve put together everything you need to know about how to plan a well-timed journey to Portugal. Set on the shores of the Atlantic Ocean, this sun-kissed country is beautiful any time of the year, yet the spring months, starting from the end of March to the end of May, as well as the autumn months, from September to early November, are considered optimal for a trip to Portugal. Why not the summer or winter season you ask? Well, the answer is quite simple as it all comes down to tourist flow and weather conditions. The highest number of tourists come to Portugal in the summer months from June to August. The end of the summer is the peak vacation season with the most travelers. Just to paint the picture clearly, this means that the prices for accommodation, transportation and basic services go up, and sometimes go up a lot. Not to mention the availability issue, implying that most of the nicer hotels, guides, tours, as well as tickets to museums and shows are most likely going to be completely booked or sold out. For this reason, these summer months are considered to be not the best time to go to Portugal. Therefore, if you're planning to have your Portugal getaway in the popular time of the year from June to August, keep in mind that you'll encounter large crowds of tourists. And from this, it follows that you'll have to cope with long lines, fully-booked hotels, crammed streets, museums, transport, restaurants, beaches, and just about every single point of interest being filled to capacity. As regards the winter months, yes, there are twice or even three times as fewer travelers in Portugal in January than in August. Among the downsides, though, are that the light days are short and there's usually much rainfall, making the winter season distinctly wet and probably also not the best time of year to visit Portugal. Overall the Portuguese climate is moderate, warm and temperate. But since Portugal stretches along the western shores of Iberia and occupies a number of islands in the Atlantic Ocean, the weather differs not only by month but also depending on the area you’d like to visit. 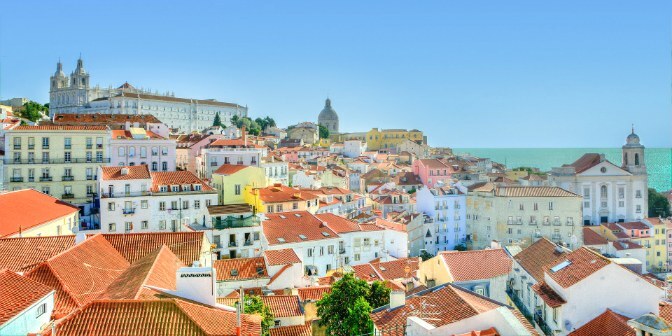 If you've cast your eyes on southern Portugal's Algarve region and want to visit places like Albufeira, Vilamoura or Lagos, bathed by the waters of the Atlantic, the best months to come are May, June, September, and October when there aren’t too many vacationers. Spring is the time when to visit Portugal to see trees bloom beautifully, and in autumn the water is very warm so it's great for beach leisure. For instance, travelers who want to begin their Portugal tour in the capital city Lisbon and also plan to see the nearby castle-sprinkled area of Sintra should consider coming here in spring, early summer or fall. In this time of the year the main attractions, museums and points of interest are relatively tourist-free, providing the opportunity for an easy-pace, undisturbed, enjoyable exploration. Temperatures aren’t too hot, around 73°F (23°C) and there is little-expected rainfall. The same time frame applies for those aiming to travel to the motherland of port wine, Porto, located further north, as well as to the wonders of its nearby wine-growing region or to off-the-beaten-track gems like Coimbra, Braga or Guimaraes. You'll surely enjoy the Porto's main sights, including the Dom Luis Bridge and the Lello Bookshop, more during this period of the year than amid crowds of people under the boiling sun. Plus the Douro Valley looks particularly charming both in bright-green spring colors and in autumn harvest shades. Those whose travel radar has Portuguese islands such as Madeira and its vibrant capital Funchal, famous for places connected with Columbus, won't go wrong by choosing to travel in June or October. Nevertheless, it's only fair to say that the weather on the non-inland parts of Portugal is nice throughout the year and doesn’t change much as the months go by. Summing up, for these reasons going on a tour to Portugal in spring or fall is the smartest decision you can make. The spring months from late March to the end of May are favorable for a colorful getaway whereas September and October are somewhat an extension of summer with great not too hot weather conditions, perfect for long sightseeing walks, and fewer tourists, all totaled making for an overall pleasant travel experience.